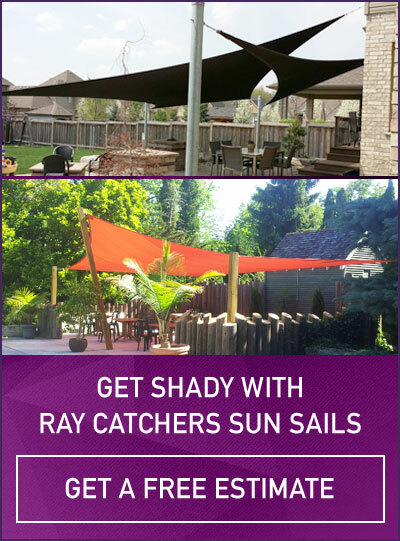 Ray Catchers Designs, Manufactures, and Installs shades sails. Over the years we’ve grown tired of finding our umbrella blown up against the fence, seeing our canopy or awning reduced to a pile of twisted metal by the wind. We are all dissatisfied with available shade structures that are unstable, give inadequate coverage or costly. Visiting Australians introduced us to a new alternative in sun protection. Well, new to us. Shade sails have been around for a very long time in other parts of the world. They are a unique replacement for pergolas, awnings canopies, gazebo, and umbrellas. When done right, shade sails are extremely stable, give wide coverage, and are very affordable. Extensive research lead us to the conclusion that we would have to make our own sails in order to get the high quality and design options we were looking for here in Canada. Ray Catchers operates out of London, Ont. But we can help you wherever you are. We are well versed in all aspects of this amazing and versatile product and can provide knowledge and support for businesses, homeowners and the Do-It- Yourselfer. Contact us to talk about your shade needs. Together we can create a dynamic outdoor living space.